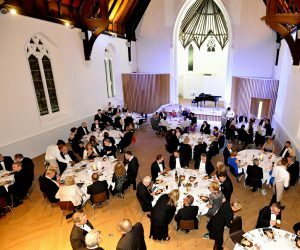 Cornerstone, Cardiff’s newest conference, arts centre and community hub opened its doors to the Welsh capital in September 2016 has been a Cardiff landmark for over 160 years. The beautiful Grade II listed building, with its dramatic colourful frontage and magnificent open span interior, was originally opened in 1855 as Ebenezer Chapel, the first Neo gothic church in Cardiff. 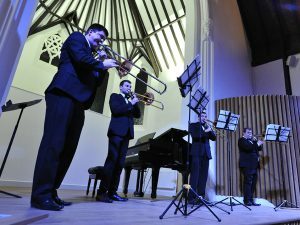 Renovated in 2015-2016 with the help of the Heritage Lottery Fund, Cornerstone is a hub for the community, business, arts and weddings, which caters for parties, weddings, VIP dining, corporate meetings, concerts, exhibitions and more. Its community hub features a cafe, communal spaces for local events, and rooms to suit any occasion. It was officially opened by HRH the Prince of Wales in December 2016, and its been serving Cardiff’s people ever since. 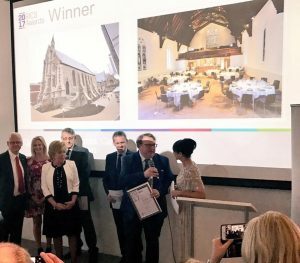 In 2017 Cornerstone was awarded the 2017 Royal Institute of Chartered Surveyors Awards, Wales Building Conservation Award. Cornerstone is steeped inhibitory as a major landmark and community hub that has been part of Cardiff life for 160 years. A Grade II listed building, its dramatic colourful frontage magnificent open span interior it opened in 1855 as Ebenezer Chapel, the first Neo gothic church in Cardiff. The building was created by leading Victorian architect, Robert George Thomas of Monmouthshire. A prolific architect of religious buildings in Wales, Thomas was to become one of the forefathers of modern Australia as founding planner of the city of Adelaide. Reflecting its international appeal, Cornerstone is characteristcially faced in multi-coloured ballast stones from ships that plied between the port of Cardiff and exotic shores. In 2010 the chapel was vacated by its Welsh-speaking Presbyterian Congregation as it required prohibitively expensive restoration. The building was rescued but he Catholic Archdiocese of Cardiff, which purchased the chapel in 2012. Aided by a £1.2 million Heritage Lottery Fund grant, the building was re-born as Cornerstone, transformed into a centre of community life within Cardiff city centre, preserving its historic architectural fabric. Opening in 2016, it has been brought back to life as a vibrant and exciting mixed-use community hub and corporate venue. Cornerstone has quite literally been a ‘cornerstone’ of the community for generations. Now we have opened up more than ever before to the community in the widest sense, becoming a much needed new hub for many sections of society in Cardiff. With a unique ambience and awe-inspiring interior, Cornerstone is truly a flexible hub for the community providing a perfect venue for conferences, seminars, meetings, corporate hospitality, private parties and dinners, or just a plain and simple cup of coffee. Cornerstone hosts a meeting room, private dining room, a mezzanine floor and the truly awe-inspiring Great Hall for your next gathering. The facility is fully equipped with Wi-fi access and also provides access to a full-depth stage and large screen TVs for your presentation needs. To find out more about each of the facilities Cornerstone has to offer, just visit our Bookings section. Cornerstone is also Cardiff’s newest arts space, benefiting from a full-depth stage, historic purpose-designed acoustics, and a truly inspiring space for art that will get your creative juices flowing. Our Great Hall Dewi Sant has a capacity for various seating arrangements, and our stage is perfect for rehearsals, drama, and musical productions. We are also committed to working with artists and invite you to contact us with your exhibition and installation ideas. From a meeting between two people, to a sit down gala dinner, Cornerstone caters for it all. 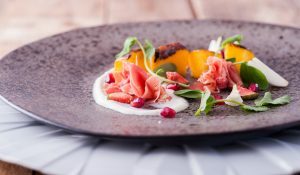 Renowned for superbly imaginative cuisine, our award-winning in-house team at Spiros Fine Dining Caterers are here to ensure your event is tailored exactly to your needs and budget, with consummate taste, style and professionalism. Spiros Fine Dining Caterers have over 30 years’ experience of working with venues of all sizes. The team based at Cornerstone are on hand to handle every aspect of your event, from initial contact, to planning assistance and advice, budgeting, and of course being there for you on the day.